The GOP candidate’s bus tour skips communities battered by Bain Capital. Mitt Romney’s “Every Town Counts” bus tour brought the presumptive Republican presidential nominee across southern Wisconsin and into Iowa Monday and Tuesday. But the towns didn’t count enough for him to learn their real histories and their real needs. And the tour scrupulously avoided towns where Romney’s Bain Capital continues to put the hurt on American workers. In Janesville, Wisconsin, where a sprawling General Motors plant closed three years ago, socking the town with one of the highest unemployment rates in the region, Romney failed during his stop to discuss the plant or GM. He couldn’t exactly rip into his November opponent, Barack Obama, for not doing eneough to reopen the plant—a credible gripe—since Obama worked during his first term to save GM while Romney talked up the idea of letting the company go bankrupt. That’s the problem for Romney. He has been on the wrong side of so many economic fights that it is impossible for him to play the economic populist in communities that could stand with a little populism. 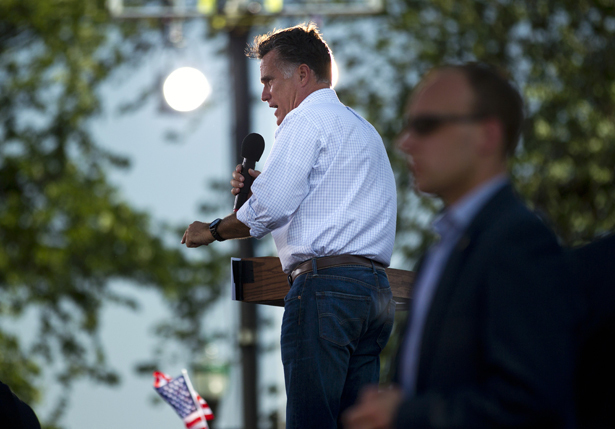 But the real story of Romney’s tour is the towns that don’t count with him. When Romney made stops in Janesville and Dubuque Monday, he was just up the road from the town of Freeport, Illinois. But Romney did not stop in Freeport, a town that like Janesville and Dubuque has been hard hit by trade and fiscal policies that encourage corporations to shutter US factories and ship jobs overseas—and that has been even harder hit by speculators who buy up factories, strip the assets and close them. The Sensata Technologies plant, which has been on the forefront of producing state-of-the-art automotive sensors, was owned by Texas Instruments, and then by Honeywell, before being sold in 2010 to Sensata Technologies Holding, N.V, a firm based in the Netherlands but majority-owned by Bain Capital. Bain, the private equity firm that Mitt Romney helped to develop and that continues to make him a very rich man, has since consolidated ownership of Sensata. The workers at the plant wanted Romney to make a slight detour on his bus trip and take a look at the devastation being caused by Bain’s machinations at a plant where many of them have worked for more than thirty years. The plant’s operations are rapidly skrinking as Sensata moves to outsource work from Illinois to China. “This used to be a very high-volume plant and now it’s pretty much a ghost town…and by the end of the year it will be a ghost town”, Sensata employee Cheryl Randecker told local reporters. Had Romney come to Freeport, he would have heard how much Bain’s approach has harmed not just the Sensata workers but Freeport and counties along the Illinois-Wisconsin stateline that have suffered more than their share of plant closings. “Sensata is moving forward with the process of relocating jobs from their operations in Freeport to China,” explains John Blum, the chairman of the Stephenson County Board. That’s a story that Mitt Romney does not want to focus attention on. So his bus didn’t stop in Freeport. But those Americans who really do believe that workers in places like Freeport ought not be left behind should ask themselves whether talk about renewing the American economy is credible coming from a man who continues to profit from the plant closings, the layoffs and the outsourcing practices that are crude byproducts of Bain Capitalism.